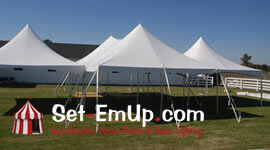 Serving the greater Nashville area including southern Kentucky and Middle Tennessee, Set-EmUpTent Rentals, has been setting up beautiful tents, dance floors, and lighting for nearly 10 years. With years of experience and satisfied clients, We are friendly and professional, delivering quality service and products at your important events. Owned and operated by Dan Smith, Set-EmUp will help guide you in the event planning process offering advice and service options to help you select the right tent for your event. We help with a variety of events and celebrations from weddings, graduations, and birthdays to fundraisers, estate sales, and auctions. Tents provide protection from the elements so your event can proceed regardless of rain, cold, or extreme heat. Event rental options also include tables, seating, linens, DJ, and sound systems.